John this is for you. 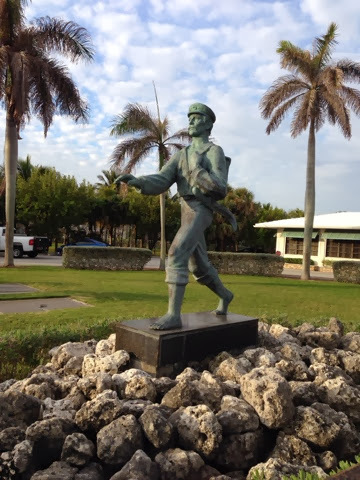 The term barefoot mailman refers to the carriers on the first U.S. Mail route (1885-1892) between Palm Beach and the settlements around the body of water known as Lake Worth on the north, and Miami,Coconut Grove, and Lemon City to the south. The mailmen had to walk and travel by boat because there was no road connecting the 68-mile route from Palm Beach to Miami. Approximately 28 miles of the one way trip was by rowing different boats, and the rest by walking along the firmer sand along the beach. The route was a Star route, with the carriers contracting with the Post Office. The route was originally called the "barefoot route" and the carriers were called "beach walkists" or "beach walkers". It was not until around 1940 that the term "barefoot mailman" came into use. Nice. That is pretty cool. Interesting, quirky, and a neat little picture. Thanks Chief. Keep up the good work and stay warm. 20 degrees at 1:30 pm today.